Of nature’s many wonders, few are less outwardly inspiring than seeds. For starters, they’re small, and they tend to get stuck in one’s teeth. In fact, they don’t do much at all until they’re well out of sight, beneath the soil, and then only after a period of time. But consider what they carry inside. Take a kernel of sweet corn, for instance: Within each one resides the memory of a thousand or more summers, of a home in the plains of central Mexico, of the untold hands that stewarded and selected the strains of corn that became the buttered ears we enjoy today. Originally from kansas, Waskiewicz was in his mid-20s when he first heard of the work being done at Seeds of Change, the pioneering organic seed company headquartered in New Mexico. He worked there for five years before embarking on his own farming enterprise in nearby Gila, where he grew organic seeds for his former employer and raised vegetables for sale at market. 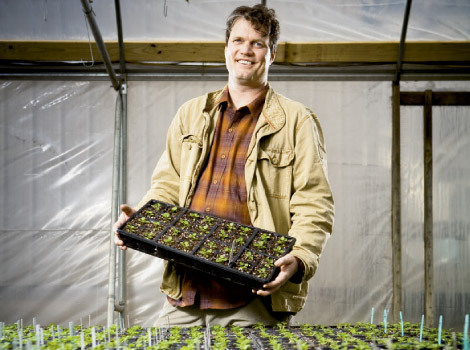 In 2000, he laid down his hoe and decamped for Western North Carolina, where he helped found the engineering and site design firm, Southeast Ecological Design. His timing couldn’t have been better. The seed business has blossomed even as the economy has faltered in the past year and a half, as more and more Americans look to save money by growing their own food. Today, Sow True Seed inhabits a stucco building just south of downtown. On a late winter afternoon, employees stand beside a pair of long tables beneath fluorescent lights, carefully sorting seeds and dispensing them into packets. Prior to being readied for shipping, they are held en masse in a cold storage locker, in plastic buckets colored white or black depending on whether the seeds were produced by organic or conventional means. “This is crunch time for us,” says Waskiewicz. The seeds are on their way to clients across the country in time for spring. For most of history, seeds were saved and traded by the people who grew the crops. At one time, all varieties were open-pollinated, meaning that if allowed to reproduce under field conditions they bred true, yielding stable offspring with the desired traits. The years following World War II, however, saw the ascendance of F1 hybrids, varieties created by breeding together parent lines derived from inbred stock. It was nothing short of a revolution. These plants offered better yields and uniformity of crops that were ideal for commercial farmers. Yet their shortcoming is that hybrids don’t breed true, meaning their offspring vary wildly in the second generation. And since producing them is tricky, the control fell to companies. Seeds, the most crucial component in agribusiness, became proprietary technology. As hybrids gained popularity for producing reliable crops, older varieties of vegetables were abandoned and many disappeared altogether. Today, open-pollinated crops are considered heirloom if they were in production before World War II. In fact, much more than nostalgia—a yen for the tomatoes and melons that grandma grew—was at stake, for the older varieties often carry traits for disease resistance and adaptability that hybrids lack. Beginning in the 1980s, the pendulum began to swing the other direction through the high-profile work of organizations like Iowa-based Seed Savers’ Exchange and Seeds of Change. “There’s still a lot that can be done with the open-pollinated strains in terms of improvement,” says Waskiewicz. As an example, he offers the Detroit Red, an open-pollinated beet that performs well across most of North America. “Almost every seed company carries it,” he says, “but within that one variety there are so many different strains.” Some of these strains are good, others less reliable, or less uniform in shape, size, and flavor. With so many varieties, it might seem hard for Waskiewicz to pick favorites. But he does, and they tend to have stories closely linked to the mountains of Western North Carolina, like the Candy Roaster, a winter squash of impressive size and sweetness; and greasy beans, a category of pole beans named for their hairless seedpods and prized for their rich, buttery taste. At present, Sow True Seed purchases seeds from growers and seed houses across the country. But Waskiewicz aims to one day offer more regionally produced varieties, with a majority of them from farms in North Carolina, keeping them closer to the fields and gardens where they will eventually be grown. “Our goal is to have more organic and regionally produced varieties each year until we have more than any other seed company in the country,” Waskiewicz insists.